There is little to compare to celebrating America's Birthday under the faces of the country's most famous men. Enjoy a day full of fun at Mount Rushmore. Overview: Each year the Fourth of July or Independence Day Celebration at Mount Rushmore provides the visitor with great entertainment. During the day music is provided by live performers which are sure to please everyone. In addition there are performances along the Avenue of Flags, Military honors, a flag folding ceremony, Declaration of Independence reading, a US Air Force flyover and the monument lighting complete two days of activities. When: Held every year on the 3rd and 4th of July. Fees: Just the monument parking fee of $10. Details: The events take place over July 3rd and 4th and are coordinated with the area towns celebrations. Each year there are flyovers scheduled for the afternoon and evening. Generally the formal program will begin around 8:30 p.m. with a welcome from the Memorial Superintendent. the two days of events are filled with a Flag Folding Ceremony, music from local musicians and the Ellsworth Air Force base band, Veteran's recognition, monument lighting and so much more. The entire celebration is dedicated to veterans and active duty members of the military. No Fireworks! At this time, the fireworks celebration that Mount Rushmore is known for providing has been placed on an indefinite hold due to the fragility of the forest lands surrounding the memorial. The level of risk for wildfire in the immediate memorial area has been determined to fragile to hold a fireworks show for the foreseeable future. The National Park Service supports the Black Hills communities in offering responsible fireworks displays. 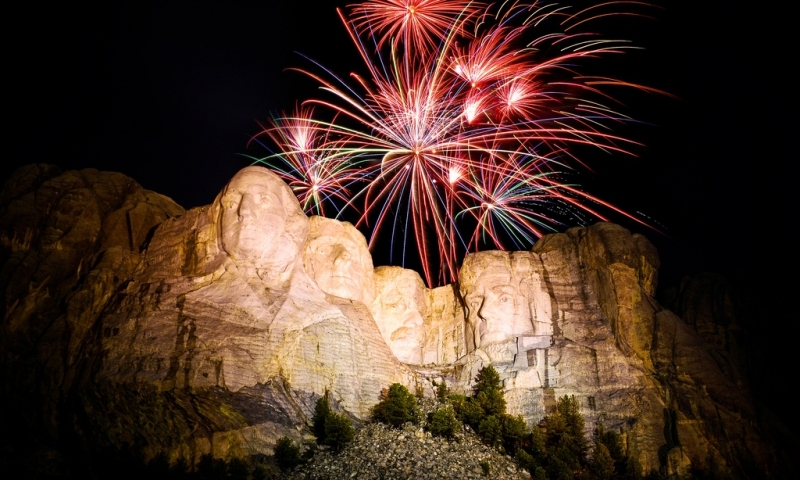 Make sure to check out the fireworks schedules in these communities to combine with the Mount Rushmore Memorial events. As South Dakota's only 3-star certified GREEN restaurant, we offer guests a plethora of delicious choices for dining and snacks including pizza, dessert, espresso & more.